Henry L. Foss's copy of general orders No. 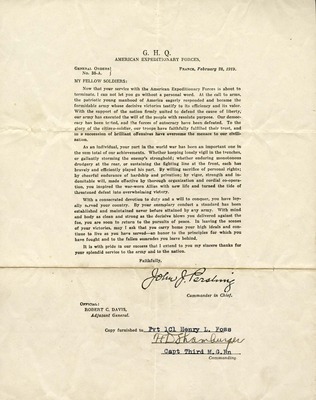 38-A from Comander and Chief John J. Pershing dated, February 28, 1919. Foss has the rank of Private First Class. Other names include: Robert C. Davis, Adjutant General; H. D. Shamberger, Captain of the Third Machine Gun Battalion.